"The ground is saturated," Geoff Tennant, the fire chief in Tryon, North Carolina, told reporters Monday evening. "It is a freak of nature," he said of the collapse. "You know it's going to happen, you don't know when." "We talked a little bit about how he wanted us to stay safe and we wanted him to stay safe," Tennant said. "Then of course 10 or 15 minutes later we get the call and it was him and his photographer." 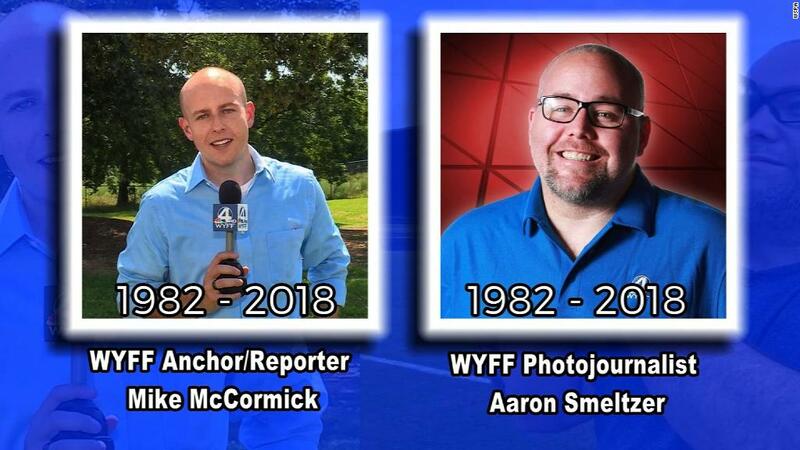 "Mike and Aaron were beloved members of our team, our family," WYFF co-anchor Carol Goldsmith said while breaking the news on the station's 6 p.m. newscast. "All of us here at WYFF 4 are grieving," co-anchor Michael Cogdill added. "We are a family. And you, our extended family, we thank you for your comfort as we mourn and as we seek to comfort the families." Later in the evening, anchors on a competing station, WSPA, called the news "heartbreaking." "While we are competitors on the air, Mike and Aaron were our friends, and part of a journalism family. We will all miss them both very much," anchor Gordon Dill said. He was "a stellar journalist all those years," Goldsmith said. Smeltzer, a native of Virginia, "shot news for more than a decade in our region," Goldsmith said. "He loved covering news, especially in Spartanburg and its surroundings." - CNN's Janet DiGiacomo contributed reporting.